Volume snapshots are different from virtual machine snapshots. See How to take a snapshot of a VM. 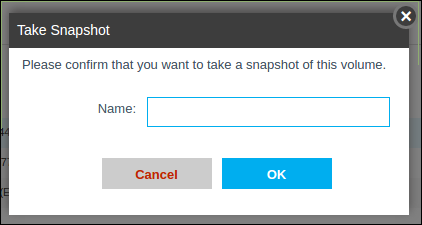 Volume snapshots can be taken manually as described in this document, or automatically at scheduled intervals: see How to setup a recurring snapshot of a volume. To make use of the data in a snapshot, you can convert it to a volume, and attach the volume to a VM in order to access the stored data. A snapshot can be converted to a template, which can be used to create VMs. See How to create a template from a volume snapshot. Click Storage in the left-hand menu. Click the name of the volume you wish to snapshot. Alternatively, you can start from the list of virtual machines (click Virtual Machines in the left-hand menu), click the name of a virtual machine, and then click the View Volumes button, which shows the root disk and any additional data disks for that VM. Use the Name text box to provide an optional name. If the name box is left blank then the snapshot will be named with the volume name plus a date and time string. Click OK to take the VM snapshot. You don't need to wait on this page for the process to complete. The creation process will usually take some minutes to complete, depending on the data size of the volume. A notification box will appear when the snapshot creation is complete. 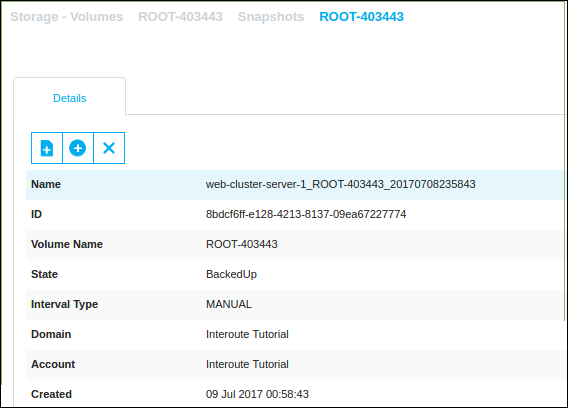 Note: The snapshot list contains manual snapshots (see 'MANUAL' in the Interval Type column) and also snapshots generated by any recurring snapshot process. Create a template: Templates that you create will appear in the 'Mine' category of the Templates panel, and in the 'My Templates' category when you deploy a new virtual machine. For details, see How to create a template from a volume snapshot. Create a volume: The volume that you create will appear in the list of volumes in the Storage panel and the contents of the volume can be accessed by using Attach Disk to attach the volume to a VM. For more details, see How to add a volume to your VM.